Vapor Power thermal fluid heaters are perfect for food processing applications that utilize indirect heating for precise temperature control. 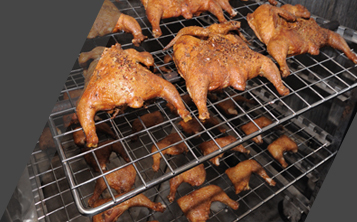 Our heaters have the ability to output up to 20,000,000 BTU/HR, providing safe heating for ovens, fryers, and other cooking requirements. The high burner turndown of up to 10:1 means a single heater can be installed instead of multiple smaller heaters, saving capital and maintenance costs. Due to our coil design, Vapor Power heaters are gentler on thermal fluid, leading to longer life for your food grade fluid. Custom skid designs are available and can include booster pump and control valve packages. Steam loads in dairy, meat processing, or other food industry facilities can often vary widely depending upon the time of day or product being run. A Modulatic or Circulatic steam generator reacts quickly to load changes, increasing efficiency of the steam system. For cyclical or shift loads, the five minute startup of our steam generators saves fuel and labor expenses. 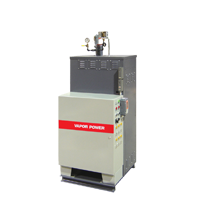 Vapor Power resistance type electric boilers are available in stainless steel construction, an ideal solution for wash down applications.